It’s time for my annual Knitmas post. 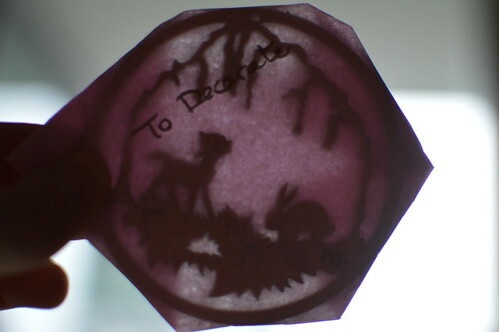 This will be a run-down of what I made and gave as well as what was made for and given to me. Be prepared to see some beautiful things. 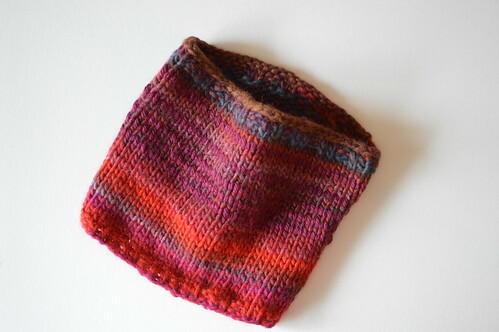 The main handmade item is a cowl. 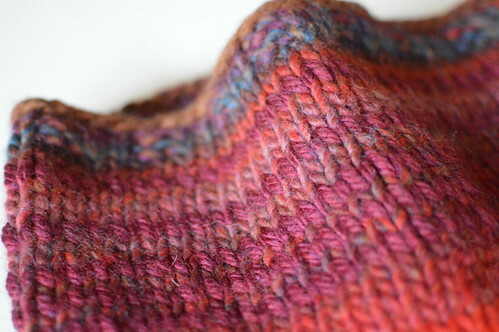 I used two super chunky wools to knit this in the round. 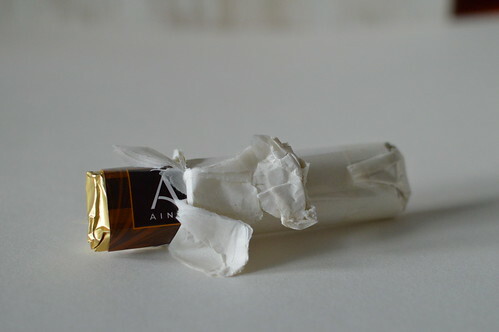 The outcome is squishy yet firm. Very nice to wear on a windy day. 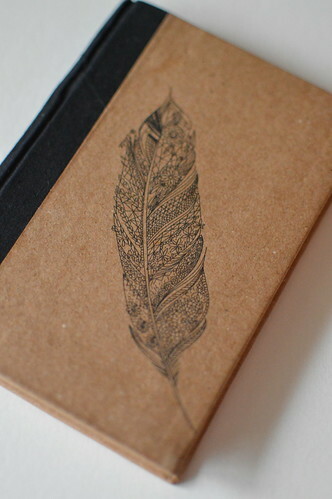 A notebook to make crafty insightful notes of genius… or grocery lists. A Christmas ornament of carved wood. 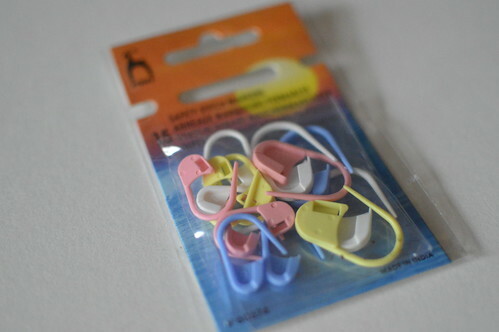 Stitch markers. These were on her wish list. 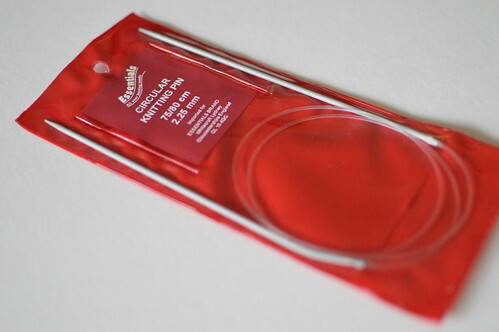 Fixed circular knitting needles in 2.25mm with an 80cm cord. This was on her wish list. 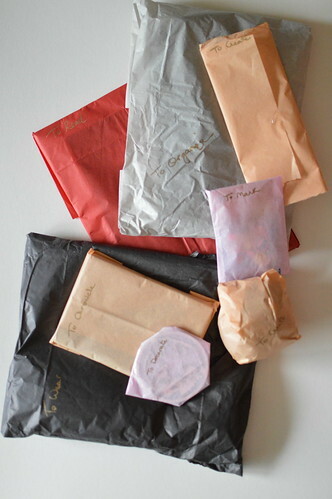 The other handmade item in the parcel was a project bag I sewed for her. 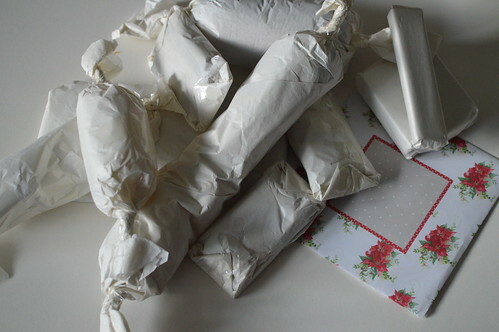 She listed a project bag in her Elster wishlist. 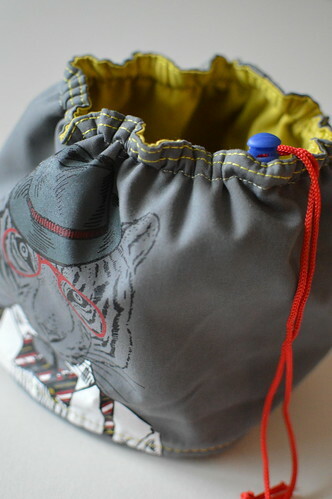 I adapted a fun fabric bucket from Penney’s with a custom drawstring. It took longer than you’d expect, but was worth the result. 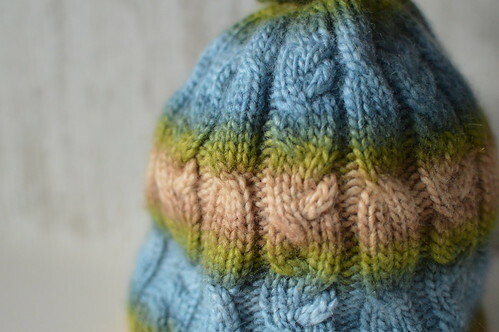 My favorite colors in one cable knit hat. I rarely knit cables, so this is such an amazing gift. A closer look at those cables. I don’t know the yarn used, but isn’t it beautiful?! 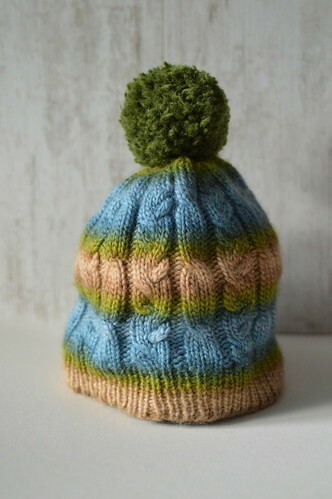 Look at that hearty pom-pom on top! 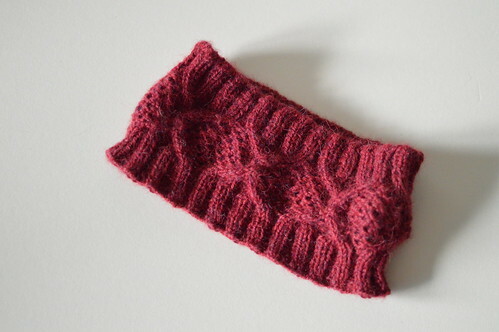 A headband ear warmer with cables! Cables! 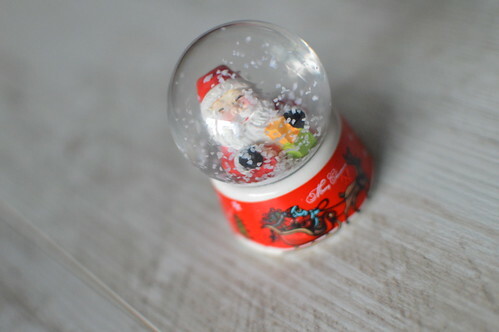 I love little snow globes! 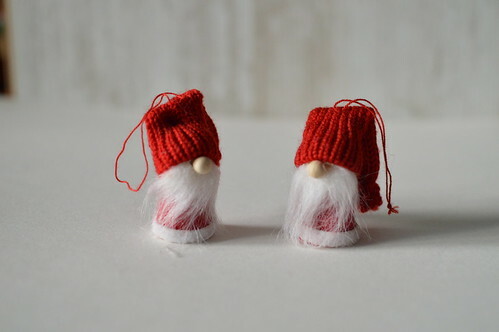 Cute little gnomes for my Christmas tree! Nonbreakable so LB can’t hurt these fellows. Here is everything in one lovely photo. You can see the hot chocolate stirrer, the chocolate bar, the three sets of felt pom-poms, and a hank of blue-green sock weight yarn in this group photo that I didn’t spotlight above. This was a beautiful, warm, sweet, and thoughtful Knitmas gift that has all the comforts of a holiday hug. What a generous and talented upstream elf I had this year. Which was your favorite item or project? 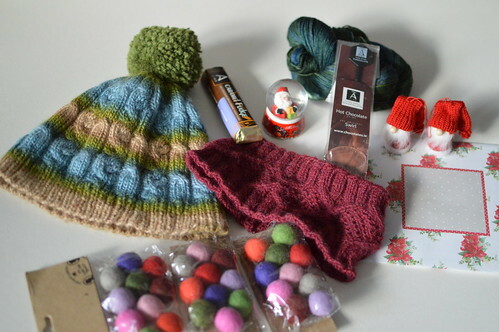 Did you participate in Knitmas or a crafty gift exchange this year? What did you make or receive? This entry was posted in Knit Hats & Gloves, Knitting Care Packages, Knitting Gifts & Supplies and tagged knitmas, stitch markers. Lots if fun things made z d lots of fun things received..I did not participate in any this year…and am not making any gifts this year..